Noodle Delight was started back in 1984. The idea was simple enough: fast food; Chinese style: "We wanted something different," says Alfred Lam, President and CEO of Noodle Delight. "We wanted to Westernize Chinese food but not with bright red sauce over chicken balls... We wanted to and needed to, keep it authentic. In any case, Chinese food is very conducive to a fast style of cooking." What stands out the most about Noodle Delight is the concept of the open kitchen. Customers can see the chefs cooking; yet their hands move so fast that one rarely sees what is going on! "Our main purpose was to show people that we weren't just microwaving food," continues Mr. Lam, "We wanted to show how unique Chinese cooking is and in particular, Noodle Delight. The original concept was to have the food on a hot plate behind plexi-glass, but that concept is too greasy and unsanitary. The open kitchen lets customers see their food being made fresh and it is entertaining as well." Most of the chefs are from China and Hong Kong. The head-chef, Zhong Xing Ci, hails from the Guangdong province of China. He is also a graduate of George Brown College's renowned culinary school. 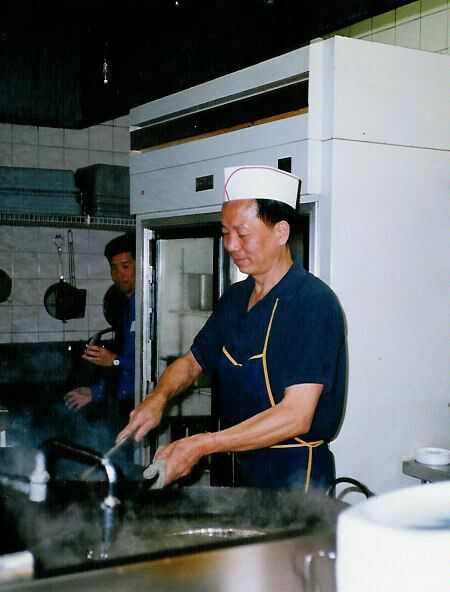 Mr. Zhong, along with three other staff, have been with Noodle Delight from the very beginning; some 23 years ago. Noodle Delight's clientele is very diverse. As Mr. Lam says, "back when we started, Chinese food in Toronto was few and far between. You really had to know where to go to find good Chinese food. You also seldom if ever, saw any non-Chinese there. But now, Chinese food is very much a part of the Toronto vernacular. As we all know, Toronto is a multicultural city and we are blessed to be exposed to such a wide variety of cultures and tastes. At Noodle Delight, we have seen a demographic shift in who visits us. At first, it was mainly other Chinese people. Now, the majority of our customers are non-Chinese. We have a lot of Filipino and Korean families who have been eating with us for two generations now. They used to eat here as kids and now they bring their kids. It's heartwarming to see such loyalty. All I can say is 'Salamat po' and 'Gamsahamnida'!" [Thank you in Tagalog and Korean]. Noodle Delight is a registered trademark of Noodle Delight Inc. Copyright 2010.